Officially Beaujolais is part of Burgundy. It’s the largest and most southerly of the Burgundy regions. It’s also the only one that doesn’t use Pinot Noir, but Gamay (or Gamay Noir/Beaujolais) for red and Chardonnay for white. Beaujolais’ vineyards take in 60 village communes and 22,870 ha in the Rhône ‘département’. The vines are planted at altitude ranging from 150 to 550 metres overlooking the Saône river plain and the N6 road. 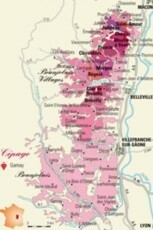 You can cut Beaujolais into two large zones: north and south of Villefranche sur Saône. To the north, the terrain is composed of granite and igneous rock (porphyry, schist). In the south it’s clay-limestone. In the north vines are short pruned (spur or cordon) or bush vines (‘gobelet’), and in the south cane pruned (‘Guyot’). The quality zone with the 10 ‘crus’ or ‘classed growths’ (the darker areas on the map) matches up with the north, and the Nouveau zone the south. The other appellation areas are called: Beaujolais, Beaujolais supérieur, Beaujolais-villages. The ‘maisons des vignerons’ (old winegrowers houses) in La Grange-Charton (Régnié), the Hameau du Vin or wine village in Romanèche-Thorins. Events not to be missed, apart from Beaujolais Nouveau (the third Thursday in November): the ‘Confrérie des Gosiers secs’ (literally Brotherhood of dry throats!) parade in celebration of Saint-Vincent (in Clochemerle) and the ‘Hospices de Beaujeu’ auction (2nd Sunday in December). The Coteaux du Lyonnais (370 ha planted with Gamay, Chardonnay and Aligoté) surrounds Lyon to the west, from Chasselay to Saint-Romain-en-Giers. Growing vines dates back to the founding of Lyon around 45 BC.